In addition to a highly-trained dentist traveling throughout Sudan, H.O.M.E. 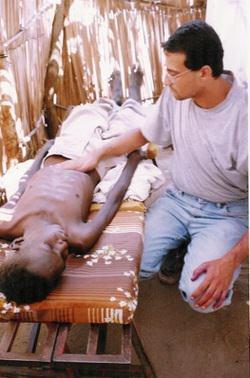 currently supports one medical clinic in Sudan and another clinic in South Sudan. The H.O.M.E. sponsored full-time dentist and his team have begun implementing a plan to provide primary dental care to refugees and local villagers through mobile dental clinics and health centers, sometimes in areas with no electricity. In addition, training has begun among local community workers in emphasizing the importance of oral hygiene to their communities. If the political climate permits, the H.O.M.E. 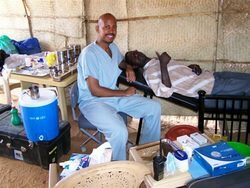 sponsored dentist hopes to establish a training program to train qualified Sudanese to provide basic dental care such as tooth extractions and simple fillings. 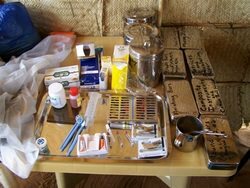 This will empower them to care for their own dental needs long after the Doctor and other foreigners have left Sudan. In addition, it will impact the overall health and quality of life for many future generations of Sudanese. Founded in 2000 by a physician burdened with a vision of coming to the aid of the many impoverished Sudanese, the Good Shepherd Clinic (GSC) in Madani reaches out to poor local citizens as well as many displaced refugees in the area. GSC is committed to offering high quality diagnostic and curative care at a very low cost to its patients. GSC compassionately serves the poorest and most destitute people in Sudan, desiring to not only heal them physically but to also share with them the saving grace of Christ. 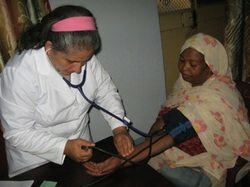 For many Sudanese seeking medical care, GSC Madani continues to be the only hope. Patients suffer most commonly from malaria, TB, typhoid, chloroquine-resistant strains of malaria, brucellosis and rheumatic diseases, and many other infectious diseases. Movies, such as the Jesus film, are continuously shown in the waiting room at the GSC, exposing patients to the Gospel of Jesus Christ. On the tables, Christian literature is available to read while waiting. Used to the harsh living conditions in one of the poorest countries in the world, patients are frequently surprised with the gentle way they are treated, as the staff portrays the loving image of Christ through special kindness. In addition, they often pray alongside the patients, asking the Lord to heal them –many come to believe in this way. A large number of patients in Sudan suffer from advanced stages of diseases, and GSC Madani hopes to expand its services, offering more effective treatments. Adding specialized doctors in tropical medicine, diagnostic radiology, pediatrics, and obstetrics is a priority. GSC Madani leaders are also working towards developing this facility into a diagnostic hospital in the near future. Seeing the remarkable positive impact that the Good Shepherd Clinic (GSC) in Madani was able to make in the lives of many destitute Sudanese, another clinic was established in Juba in 2003. With the same goal of offering quality healthcare service at a low cost, this clinic has set out to minister to a needy people. Unable to pay for treatment and medications with more than gratitude, patients here come to experience the grace and healing of the Lord during their visit, both in word and deed. The Juba clinic is strategically located to service a large proportion of the city’s population, as only two other public clinics and one private clinic exist in Juba. Soon after the foundation of the clinic, the original plan to wait several years before expanding and adding a laboratory and a maternity unit was expedited in view of the obvious need, and an additional room was constructed. 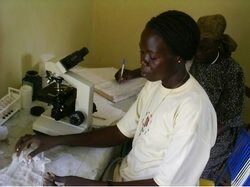 The Juba clinic receives over 500 patients every month. Patients at GSC Juba generally suffer from conditions similar to those treated in the Madani clinic. GSC Juba also puts much effort into sharing the living Gospel with its patients, distributing Christian literature and spending time in prayer with patients for healing of both the body and the mind. In this environment of healing, many are receptive to the message, and the Lord’s glory is revealed through their changed hearts. Looking to open the labor unit shortly, the clinic is planning to add additional staff, especially doctors specializing in areas such as gynecology and pediatrics. Developing the Juba center into a diagnostic hospital is one of the main future goals for GSC Juba.